There’s nothing sophisticated about it. You walk in to a winery like Empordàlia and go straight to the back of the place. 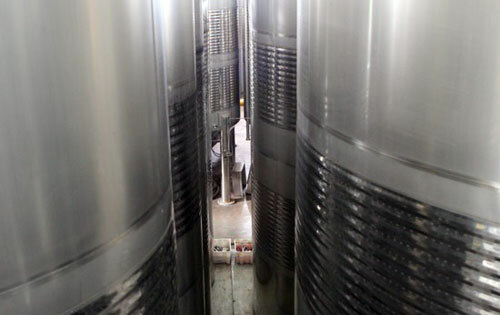 There, you will find the massive 10,000 or 25,000 liter stainless steel tanks looming like sentries. At the bottom, a spigot. Nearby, your selection of large or small plastic bottles if you forgot to bring your own. In Spanish and Catalan it ‘a granel’ or ‘bulk’ wine. There is no big secret to it here though. You can find it anywhere in Europe where they make wine, although we’re of the opinion that the best versions of it are in countries along the Mediterranean. In 2007 for instance, we stayed with a Croat who owned a pension in Dubrovnik and every week he would lug in a 10L bottle of bulk Plavac Mali that he bought from up on Pelješac Peninsula. Naturally the assumption is that if you’re paying €1 a liter instead of €10 for a 750ml bottle, then the quality is going to be less. In some wineries this may be the case, but for everything we’ve ever tasted that was bought in bulk, such as the offer from Empordàlia, we taste no difference. Their bulk Criança and the properly bottled Criança are exactly same, although there may be a scratch less alcohol in the bulk version. Naturally the big difference is the staying power down the line as air is both your best friend and your worst enemy with wine. If you buy the bulk wine and plan to keep it for more than a day or two, you need to a) put it in a glass container and b) keep as much air out of there as possible ideally through the use of neutral gases, although that requires setting up quite an operation. Otherwise, it will oxidize quite fast and while this is desirable while one is drinking the wine, when one is storing it, it’s going to produce something squalid. Given the difficultly in this, it’s not a surprise that during the summer, the main bulk customers are Germans and French stocking up on quality bargain booze for the beach as Empordàlia is on the way to one of the closest beaches to the French border. Good times and good sun with good wines.